Anyone who has had the pleasure of cooking on a camping trip will be familiar with the ubiquitous green propane cylinders which fuel camping stoves. While these cylinders are commonplace, their disposal has long been a sustainability nightmare for local campgrounds. In recent years, Ontario Parks introduced their OrangeDrop program with high-visibility bins where campers can dispose of their cylinders responsibly before they are transported to local recycling facilities. 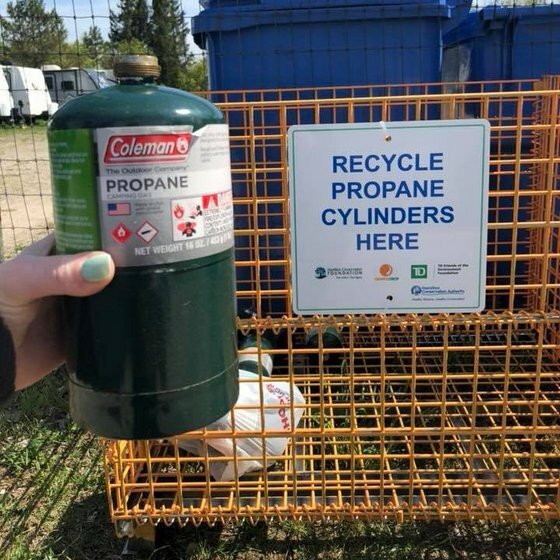 As a result of a grant from TD Friends of the Environment Foundation and donations to the Hamilton Conservation Foundation, Fifty Point CA, Christie Lake CA and Valens Lake CA now host OrangeDrop bins and plenty of educational signage to ensure that cylinders are recycled. Before this program was introduced, canisters were often found in trash cans or worse, tossed in an inconspicuous area of brush. Now that the recycling program has launched, staff who once discovered littered canisters on a daily basis are going weeks without finding them. This entry was posted in Latest News, News on June 29, 2018 by tobytresidder. 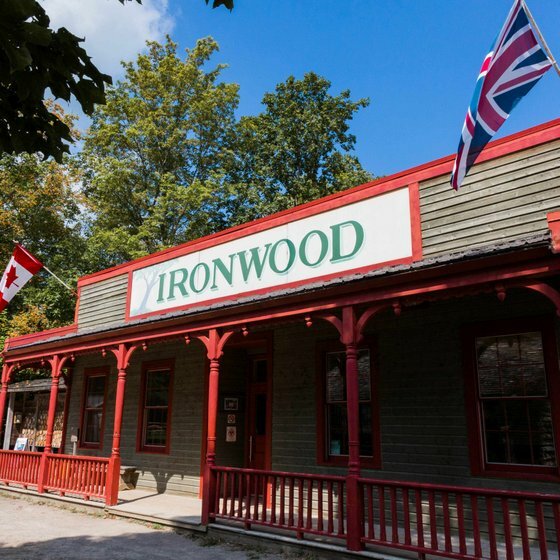 This past Sunday (June 24th) saw dozens of volunteers and community members gather in Westfield’s Ironwood Hall to review an early draft of Westfield Heritage Village’s new Master Plan. The plan will drive capital development in and around the Village for the next ten years. While this might seem like a dry exercise, it’s important to note that this is the first Master Plan since the Hamilton Conservation Authority acquired a number of natural properties behind the Village. This plan will direct how those lands are developed and integrated with the Village. The plan will explore passive recreation opportunities, trails and interpretive opportunities in the newly-expanded area which has the opportunity to offer a larger conservation area experience similar to what is offered at other HCA conservation areas. Anyone who wishes to review the plan and comment is invited to please contact Katherine Smith at 905-525-2181 ext 117 or Katherine.smith@conservationhamilton.ca. With the Foundation’s increased commitment to the Outdoor Environmental Education Program and donations to the Education Fund being more important than ever, we thought we’d share a letter sent to our program staff. Hi Beth, Thank-you so much for having the Hess Street School students. The guides for orienteering and our hike were excellent with the students. I know my kids can be a challenging group and both Sandy and Jamie (I think I have the name correct) were amazing and very professional. One of my students described the woods as “Just like a painting”. I am very grateful they had the opportunity to see the Dundas Valley! Hamilton Conservation Authority is only able to offer this program because of generous people like you. Starting this January, donations to the Foundation now provide 100% of HCA’s contribution to the program. For your help in making this happen, we cannot thank you enough. With your support, we look forward to getting more students just like Ms. Cooper’s Grade 5/6 class learning about the environment outdoors. This entry was posted in Latest News on March 15, 2018 by tobytresidder. The Burlington Runners Club will hold their annual Sulphur Springs Trail Race in the Dundas Valley Conservation Area on the weekend of May 26-27. We were lucky enough to host their Race Directors, Tim and Andrea, at our February Board of Directors meeting. Tim and Andrea brought the proceeds from the 2017 event which totaled $4,800. The decades-old annual run has played a vital role in caring for the 40km Dundas Valley CA Trail Network with event proceeds supporting the Dundas Valley Trails Fund. In recent years these donations have been used to install new bridge crossings, stabilize trail washouts and lay screenings to improve trail resilience. (L-R as pictured) Ine Wauben – Foundation Chair, Llewellyn Smith – Chairman – Helderleigh Foundation, Santina Moccio – HCA Chair, Tony Valeri – VP Corporate Affairs – ArcelorMittal Dofasco, Bob Bratina – MP Hamilton East – Stoney Creek. This entry was posted in Latest News on September 7, 2017 by tobytresidder. Lead corporate donors Rothsay have once again stepped up to provide $15,000 to help children learn about the environment outdoors during the 2017-18 school year. Donations help Dundas Valley trails bounce back from spring washouts. Top: Carissa Bishop, Dundas Valley Superintendent (left) presents a cheque on behalf of event participants to Ine Wauben, Foundation Chair (left) and Scott Peck, HCA Deputy CAO (centre). Bottom: The Sulphur Springs Trail Race’s 200km run gets underway in the Dundas Valley CA organized by the Burlington Runners Club. With the continued support of the equestrian and running communities a significant set of repairs has been completed on the 40km Dundas Valley trail system. Sections of the John White and Spring Creek Trails were washed out during an April 20th storm that saw over 70mm of rain overnight. Work to repair the trails was completed in August along with work to replace seven aging and weather-battered trail bridges in the Conservation Area. The award will be presented at the 38th annual Environmentalist of the Year Awards at a dinner at Michelangelo Banquet Centre in June. You can find out more details about the dinner at http://conserversociety.ca/projects/environmentalist-of-the-year-awards-dinner/. Click here to access the printable application form. This entry was posted in Latest News on April 11, 2017 by tobytresidder. The Hamilton Conservation Authority (HCA) Board of Directors is pleased to announce that Lisa Burnside has been named HCA’s new chief administrative officer. Lisa was the Director of Human Resources with the HCA before accepting the new position. Lisa Burnside held the first Human Resources position with the Hamilton Conservation Authority, starting with the HCA in July 2002. She was designated as an alternate acting CAO, holding the position during vacation periods over the past several years. Lisa has also worked closely with past CAOs, who have inspired and challenged her with leadership projects and roles to develop her skills for this position. Lisa holds an Honours BA in Labour Studies from McMaster University and the Certified Human Resources Leader (CHRL) professional designation from the Human Resources Association. Her previous experience includes working for Tempel Steel (formerly SIEMENS) with the process engineering department on safety initiatives, transitioning to manage the human resources department and working with internal departments for ISO 9000 training and audits. Lisa Burnside was born and raised in Hamilton and now resides with her family in Ancaster. She has a passion for natural areas and grew up enjoying outdoor recreation in conservation areas including hiking, cross-country skiing, canoeing, fishing and exploring the outdoors. She began her new position at the HCA on Friday, February 3. Three fundraising successes to celebrate! Three groups warmed our hearts this winter season with their extraordinary generosity. Their donations will be put to work at the Dundas Valley CA, the newly planned East Escarpment CA and at the Eramosa Karst CA. The Foundation is lucky to enjoy the friendship and generosity of these community groups which help us do far more than we ever could on our own. The Burlington Runners’ Club renewed their support for the Dundas Valley Trails Fund once again this winter with a donation of $12,000. The funds represent the proceeds of the Club’s annual Sulphur Springs Trail Run and help keep the sprawling 40km Dundas Valley Trail System in great shape year-round. The Heritage Green Community Trust renewed their support for the new planned East Escarpment conservation area. The donation is part of a three-year pledge of $2 million to support HCA’s efforts to control flooding in Stoney Creek and establish a new conservation area. The Friends of the Eramosa Karst presented the Foundation with the proceeds of their fundraising efforts in 2016. 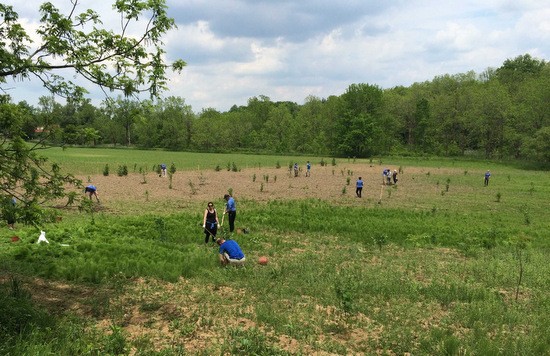 The Friends group is currently fundraising to establish new native species plantings along Second Road in the Eramosa Karst CA Feeder Lands. This entry was posted in Latest News, News on January 18, 2017 by tobytresidder.